The madness started over the weekend, when a freakish storm descended across the US from the Southwest to Michigan. While record snowdrifts buried parts of New Mexico, next door in Texas, it was summertime. Dozens of tornadoes swept through the Dallas area, damaging up to 1,000 buildings and homes. According to the National Weather Service, at least one of the tornadoes recorded this weekend was an EF4, which clocked wind speeds of up to 180 miles per hour. EF4s account for less than 1% of all tornadoes, but they’re the second most damaging class, known for leveling houses and flinging cars into the air. A day after summer-like weather and fatal tornadoes, the same regions of Texas were under blizzard warnings. Dallas had a high of 82 ºF on Saturday and was down to 41 on Sunday, according to CNN. Meanwhile, states from Michigan to Georgia saw blizzards, ice, heavy snow and rain over the weekend and continuing into the week. The result? 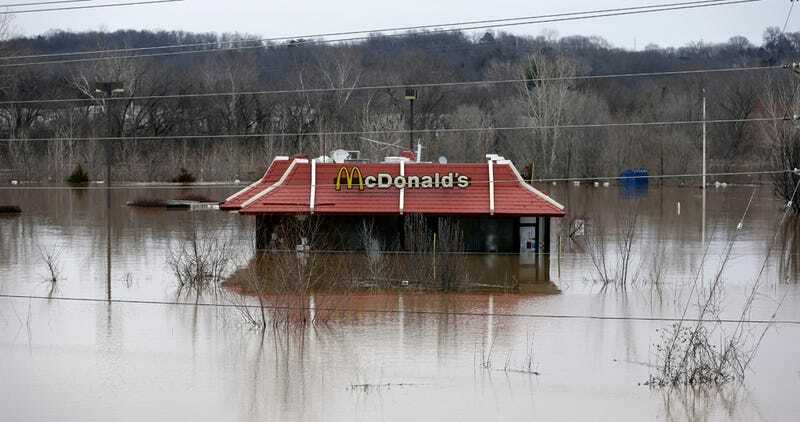 By Monday, the Mississippi river was engorged with water, leading to record flooding in parts of Illinois and Missouri. Earlier this week, Missouri Governor Jay Nixon declared a state of emergency. Hundreds have been forced to evacuate their homes as 19 federal levees across the Mississippi threatened to break. All in all, the floodnado blizzard-pocalypse has left at least 53 people dead since last week, NBC News reports. What’s behind the freakish weather? It’s complicated, and we’re not entirely sure yet. But you can bet El Niño, coupled with the general abnormality of 2015 as we rush headlong into a hotter, more disaster-prone future has something to do with it. As National Geographic points out, record-smashing high temperatures across much of the eastern US (remember July in Christmas?) are causing copious amounts of water to evaporate into the air, giving the recent storms additional fuel and firepower. Don’t forget: we knew we were in for a crazy winter. And despite all the madness, it’s still just getting started. Happy New Year!